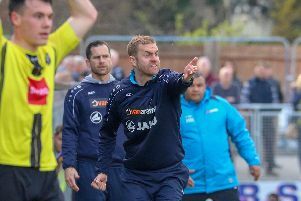 Harrogate Town Ladies manager Jon Maloney declared himself proud of his players after their journey to the semi-finals of the West Riding County FA Cup. The Wetherby Road outfit were denied a place in the final by a late goal as they went down 3-2 to Brighouse on Tuesday evening despite a spirited performance against their higher-division opponents. And although disappointed by the defeat, Maloney was full of his praise for the Town ladies, who saw off Bradford City and Leeds United Reserves on their way to the latter stages of the competition. “Obviously I’m a bit gutted to lose in the semi-final, but when you look at the bigger picture it is hard to believe how far we have come in such a short space of time,” he said. “Three years ago we didn’t even have a ladies team here and now we’re mixing it with the likes of Brighouse, Leeds United and Guiseley for a place in the final of the County Cup. “I’m so proud of the girls for everything that they’ve achieved and for their performance on Tuesday night. “We were absolutely awesome against Brighouse. They’re always up there challenging for promotion in the division above us and we knew it was going to be very tough. Town got off to an excellent start against their opponents from the FA Women’s Premier League North, moving ahead after nine minutes. A Brighouse defender handled the ball inside her own box and Sophie Tinson made no mistake from the resulting spot-kick. Harrogate keeper Kelly Jackson then pulled off a fine save when the West Yorkshire side were awarded a penalty of their own and that ensured that Maloney’s charges went into the interval a goal to the good. Town remained ahead until just after the hour-mark, Brighouse turning the game on its head with a pair of quick-fire strikes. Undeterred, the team in yellow and black hit back after 78 minutes when Tinson flicked a free-kick into the path of Becky Hale, who lifted a shot over the advancing goalkeeper. There was however to be a sting in the tail, and Brighouse snatched what proved to the winning goal nine minutes from time. The Town Ladies wrapped up their debut North East Regional Women's Football League Premier Division campaign on Sunday, thrashing Wallsend 6-1. That result means that they will finish the season in fourth place, having recorded 10 wins from their 18 fixtures.